Looking for a New INFINITI Q50 in your area? 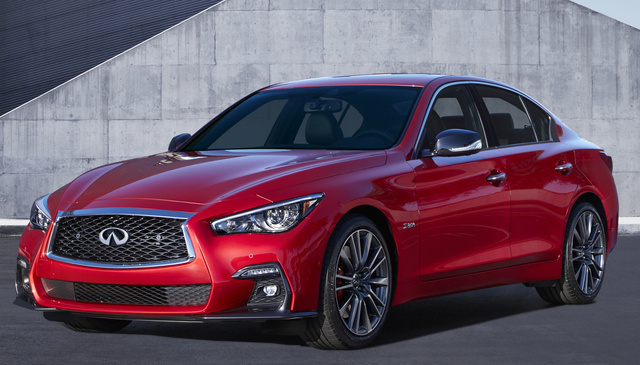 CarGurus has 221 nationwide INFINITI Q50 dealers with 27,136 new car listings. The INFINITI Q50 sedan gets its first-ever exterior update and the promise of new, partially self-driving technology for 2018. A host of smaller upgrades, from the steering wheel to trim-level names, also await prospective buyers of INFINITI’s best-selling model. The 2018 Q50 continues to be available in four trims—Pure, Luxe, Sport, and Red Sport 400—although the lower two trims have been renamed. Since 2016, the Q50 has been available with a choice of all-wheel drive (AWD) or rear-wheel drive (RWD) and three different powertrains. These options continue for 2018 and include a turbocharged 2.0-liter 4-cylinder engine good for 208 hp and 258 lb-ft of torque, a twin-turbocharged 3.0-liter V6 that makes 300 hp and 295 lb-ft, and a Red Sport 400 trim version of the same twin-turbo V6 that gets 400 hp and 350 lb-ft. All engines are paired with a 7-speed automatic transmission. Like the outgoing Q50, the 2018 model relies on drive-by-wire steering, which means there’s no physical linkage between the steering wheel and the car’s front wheels. First introduced on the 2013 Q50 and now in its second generation, INFINITI’s Direct Adaptive Steering system allows the driver to adjust the steering feel and response. The 2018 Q50 also continues to offer an optional Dynamic Digital Suspension system, which uses adjustable electronic dampers to customize the stiffness of the suspension. 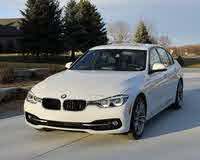 For the Q50 Pure and Luxe trims, exterior design changes are relatively mild. Both trims come with updated front LED headlamps, slimmer rear LED tail lamps, and a refreshed mesh grille and chrome surround. Sport and Red Sport 400 trims receive a more extensive exterior refresh that emphasizes their sportiness, with lower and wider air intakes and a more angular front bumper. The Red Sport 400 trim gets additional differentiating features, such as blacked-out trim and darker chrome, special 19-inch wheels, and a blacked-out diffuser at the rear designed to call attention to the dual exhaust. On the interior, every new Q50 boasts an instrument panel with faux leather and double stitching, new wood trim on the dashboard, and a new leather-wrapped shifter. A revised steering wheel, similar to the one found on the Q60 coupe, is also available, and INFINITI claims it offers better access to the paddle shifters. In keeping with its sports-oriented appearance, the Red Sport 400 trim adds red stitching and quilted seat inserts and trades the wood trim for aluminum and dark matte chrome. Across the Q50 lineup, drivers still get a dual touchscreen setup with INFINITI’s InTouch infotainment system, albeit without Apple CarPlay or Android Auto compatibility. A 16-speaker Bose sound system is an optional upgrade. INFINITI introduces a new driver-support system for semi-autonomous driving in the new Q5. Called ProPilot, it packages all of INFINITI’s existing driver-assistance systems into a single setup that includes active lane control, dynamic cruise control, blind-spot detection and intervention, lane-departure warning and lane-keep assist, and forward-collision warning with automatic emergency braking. While you won’t be able to take a nap while the Q50 drives itself, ProPilot’s camera system will keep the car in its lane, and active cruise control and automatic emergency braking help prevent rear-end collisions. More details on pricing and option packages are expected to be available before the 2018 Q50 goes on sale later in 2017. What's your take on the 2018 INFINITI Q50? Have you driven a 2018 INFINITI Q50? Enter your zip to see incentives for a new Q50 in your area. is there any way to get a list of details about on a car that I recently purchase by using this site?